There has been several rumours and speculations in the market that Google is working on the affordable Pixel 3 devices. According to the report cited by European online retail source - WinFuture, the American tech giant is planning to introduce two new Pixel devices in the market. The two new phones from Google are likely to be called as Pixel 3a and Pixel 3a XL. As per the market reports, the Pixel 3a from Google will sport a 5.6-inch with 64GB of internal storage while Pixel 3a XL is likely to be shipped with slightly bigger 6-inch display and 64GB of internal memory. Android Q First Beta Version Rolled Out To Google Pixel Phones; To Be Revealed At Google IO 2019 in May. The report also highlighted that Google is also planning to offer Pixel 3a devices in a new colour shade alongside black and white versions that we saw on previous devices from Google. It is reported that the Pixel 3a is likely to be shipped with new 'Iris' version offering a mix of blue and violet. There has been several rumours in the market for the last couple of months claiming that Google is working on Pixel 3 line-up. As a reminder, the company launched the flagship devices Pixel 3 and Pixel 3 XL last year that are doing decent volumes in the market. The company is eyeing to extend its hold in the mid-range smartphone space with the help of Pixel 3a and Pixel 3a XL. Google Pixel 3 Lite, Pixel 3 XL Lite Smartphones Likely To Be Launched By Early 2019. 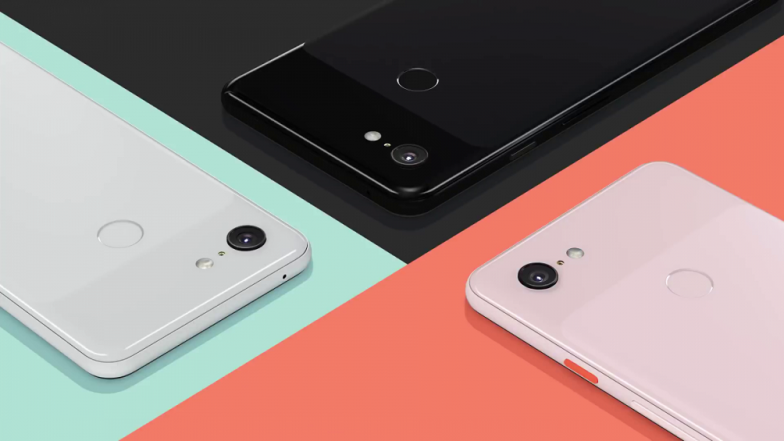 The new Pixel 3a and Pixel 3 XL are not expected to be as powerful as the regular Pixel 3 devices. However, it is speculated that the phones will sport high-end camera specifications. Additionally, the company also believes that optics department is a key selling point and it doesn't want to lose customers even in the mid-range space. Google Pixel 4 XL Likely To Come With Dual Rear Cameras & Oval Hole-Punch Display. As far as the launch is concerned, there is no concrete information from the company yet. Going by the report from WinFuture, it is speculated that the phones will be launched soon. Coming to the pricing front, the Pixel 3a could be priced at EUR 450 or $500. The WinFuture sources didn't share price details of Pixel 3a XL.